My husband really thinks I need to clean off the kitchen table, so I guess I will, and maybe even cook him a nice dinner. We have been eating off of one side of the table for a couple weeks now while I have been working on some projects. But before I clean it off I am going to have a little more fun! 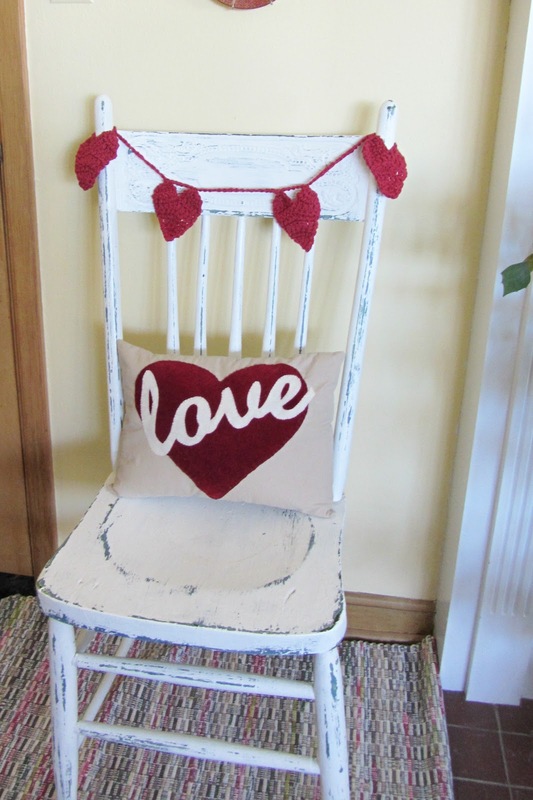 I bought a great pillow at my favorite, local, occasional store yesterday, and also a crocheted heart garland. They look great on my favorite white chippy chair. 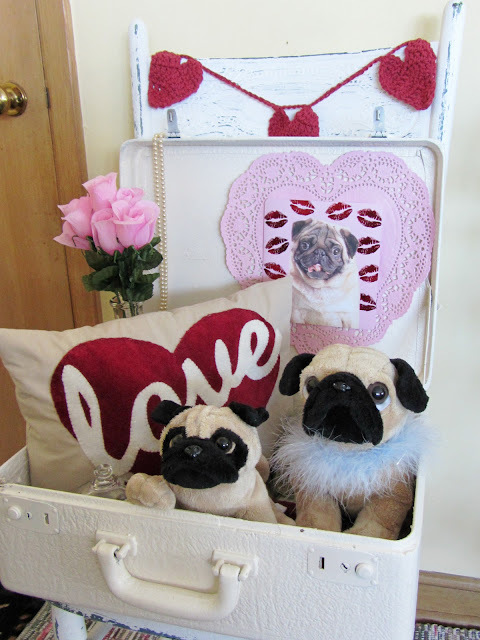 And I found such a cute pug valentine today at Kmart (I am a pug owner and lover) that an idea came to me for a "pug love" vignette in my favorite creamy white suitcase. 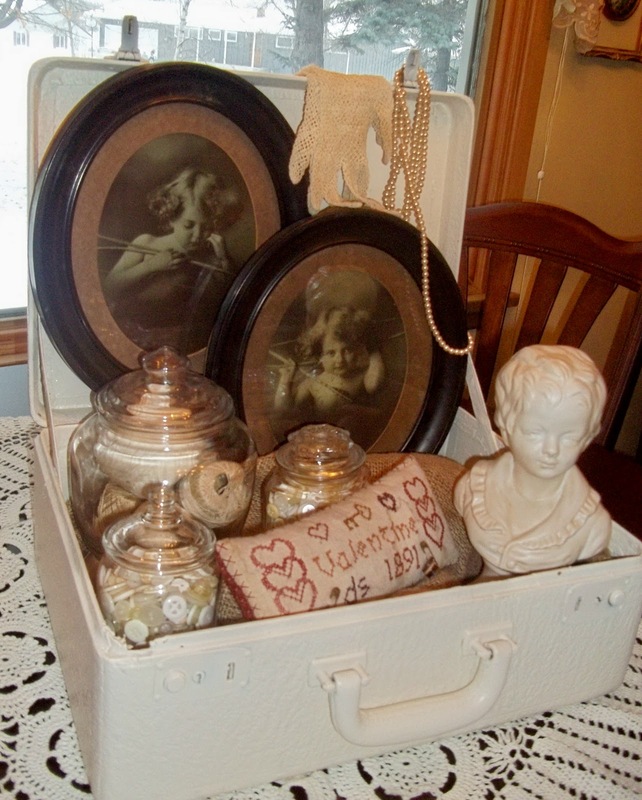 The suitcase was pretty with the Cupid Awake and Cupid Asleep vintage prints vignette, but I am going to punch it up with a little more color and whimsy. And besides that fun pug card (with all the lips attached to the paper doily on the back of the suitcase), I got another sweet card that inspired the next suitcase vignette along with my "love" pillow and heart garland. I hope you enjoyed my pre-kitchen table clean up Valentine fun! Love all your displays Carlene! Thanks Deb. The pillow is great! WHOO HOOO!!!!! Love how you displayed the heart garland!! I have a pug too!!!! 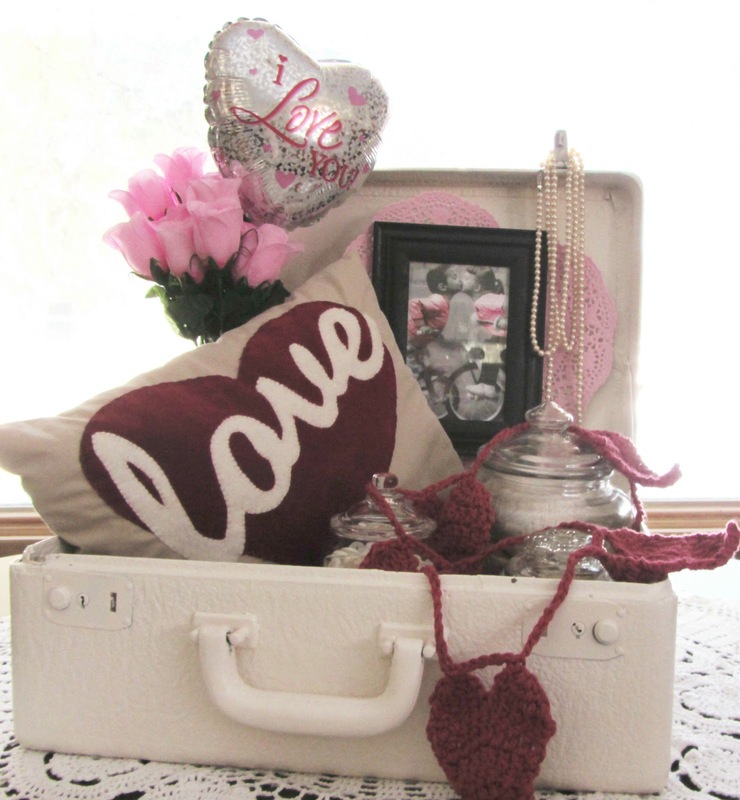 Love the vignette, esp the crochet garland and the suitcase. Thanks Debbie. We love our pug! I don't like anything on my counters. I really like all your vignettes. 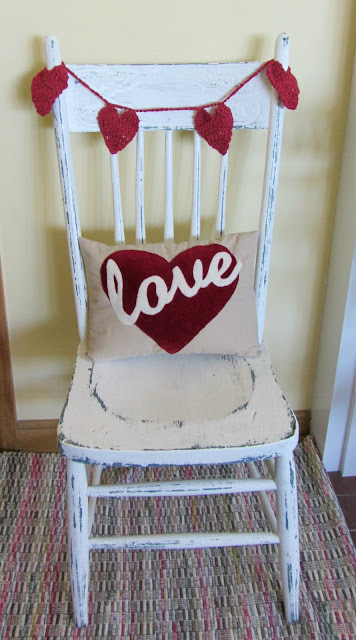 The chair is so cute with the pillow and crochet heart wreath. Love the suitcase with the pug theme. 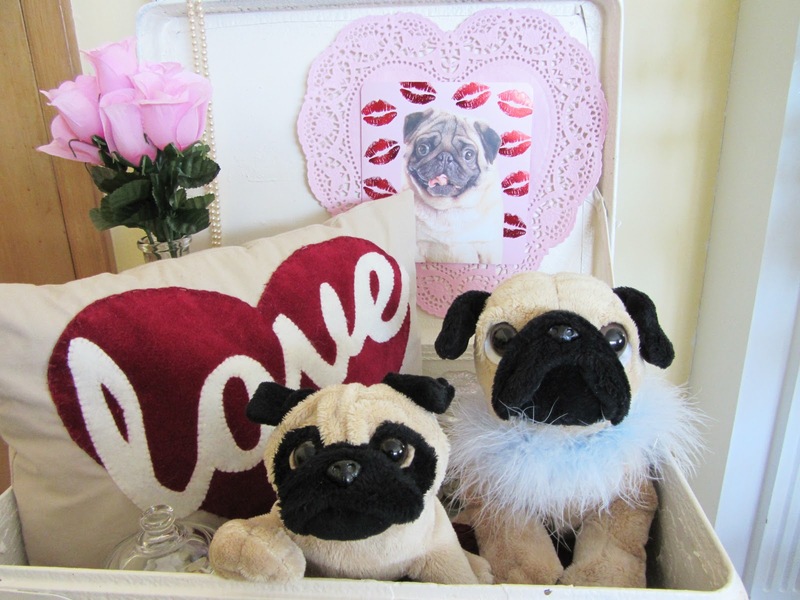 You little one is so cute in the heart, and the stuffed pugs are adorable. Lovely vignettes. Thanks for sharing you creative inspiration at Sunday's Best. Those of you who have already decorated are putting me to shame! I haven't even started crafting or decorating for Valentine's Day yet. Guess I should get started since I only have two weeks, huh? All your vignettes are pretty, but I love the one with the pugs. The most special decorating ideas are always the ones that say something about the family in the home. It's wonderful that you expressed the love of your animals in that one. You're welcome to share this or any other post in my party starting tomorrow night. 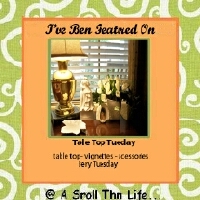 Also wanted to thank you for visitng my blog this weekend and hope you have a wonderful week! Thanks for all your great comments Shannon. I will join your party tonight! Both vignettes were darling, I especially loved the one with the pic of the lil girl and boy kissing...........so cute! Fun vignette. Those little pugs are adorable. 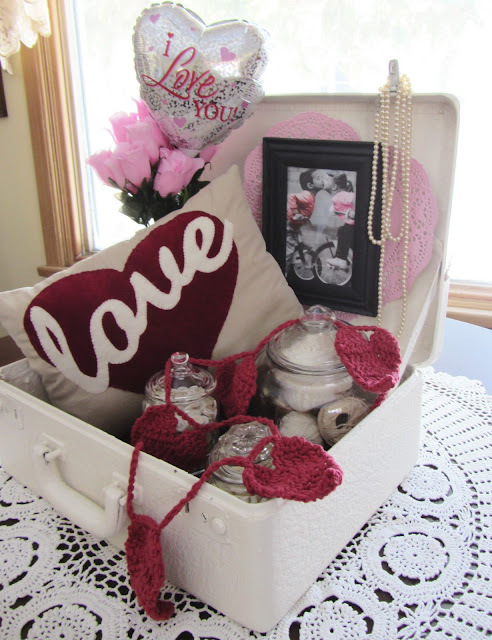 Love the vintage suitcase vignette and the crocheted garland! Your vignettes are so sweet! 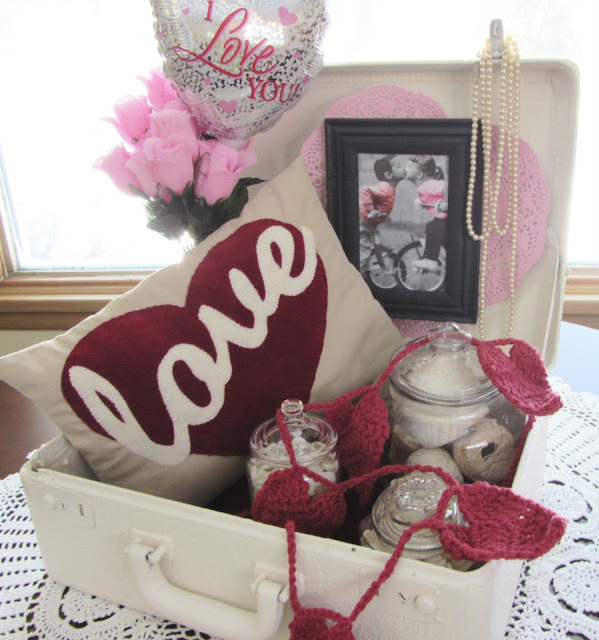 Love the white suitcase! Love the pugs! So sweet!